The possibility that a Saudi journalist was killed in the kingdom’s Istanbul consulate will add to concerns foreigners harbored about attending the crown prince’s second confab in two weeks. Morality aside, the economics of going mostly appeal to bankers – and then just barely. 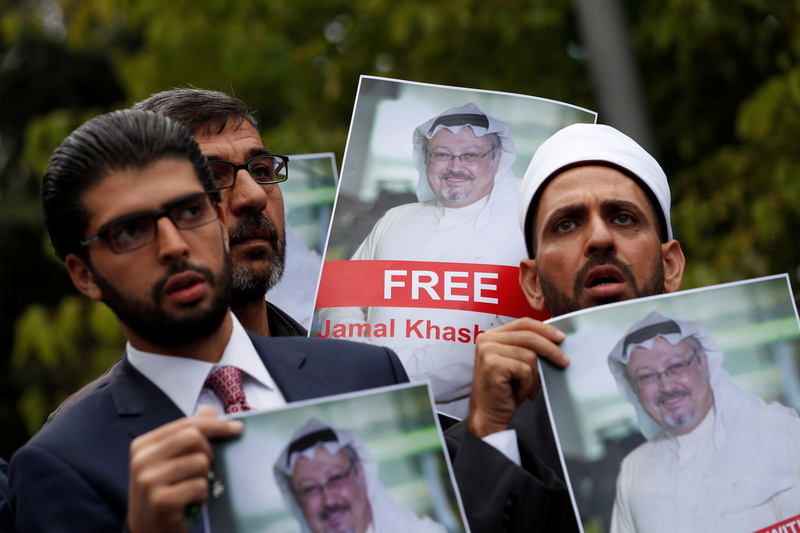 Human rights activists and friends of Saudi journalist Jamal Khashoggi hold his pictures during a protest outside the Saudi Consulate in Istanbul, Turkey October 8, 2018. Turkish authorities said they believe that prominent Saudi journalist Jamal Khashoggi, who disappeared on Oct. 2 after entering Saudi Arabia’s consulate in Istanbul, was killed inside the consulate, two Turkish sources told Reuters in a report published on Oct. 6. A Saudi source at the consulate denied that Khashoggi had been killed at the mission and said in a statement that the accusations were baseless. The consulate has also denied that Khashoggi was abducted. Saudi Arabia’s Crown Prince Mohammed bin Salman told Bloomberg in an interview published on Oct. 5 that his understanding was that Khashoggi only spent “a few minutes or one hour” in the Saudi embassy. He said the Saudi government was investigating the matter. The crown prince also pledged the stalled IPO of Saudi Aramco would occur in 2020 or 2021, and committed to invest another $45 billion in SoftBank’s second $100 billion Vision Fund.